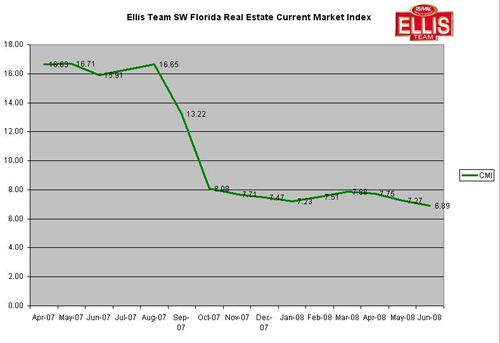 The November 2008 Ellis Team SW Florida Real Estate Current Market Index showed continued improvement again in November. We expect sales numbers to be quite positive when they are released in a few days, even if sale prices are down as has been the trend in 2008. The index fell to 6.89 for the Fort Myers and Cape Coral real estate market which is the lowest we’ve seen in years since December of 2005. Cape Coral’s inventory declined slightly while pending sales increased again, and the CMI Index number for Cape Coral is down to 5.40 Fort Myers rose slightly to 14.56. Lee County numbers overall fee to 8.64 from 9.16 in October. Most of these numbers bode well for future sales activity as this index accurately predicts future closed sales and overall market health. Condo sales in SW Florida are another story with the CMI Index currently at 22.64, up from 21.86 in October. With season approaching we’ll see if those numbers improve in the 1st Qtr of 2009. The latest industry asking for government handouts is the auto industry, which will probably be followed by the airline industry in short order. It seems everyone is lining up for the government to bail them out, and the government seems to oblige citing what a tremendous harm letting them fail would do to our economy. How we will pay for all this is not the topic of this discussion, as that would take a series of articles and discussions on it’s own. Rather I would like to discuss the notion of CEO pay and union perks. In past buyouts, politicians have been quick to limit CEO pay when the government is being asked to fork over US tax dollars to assist in saving a company. I think this is a good idea. I hate to see some wealthy CEO making millions with a golden parachute simply for running a company that would be bankrupt if not for a government bailout, and using US tax dollars to get that golden treasure chest at the end of the rainbow. Probably only CEO’s would argue with that logic. Now comes the tricky part. Unions back politicians. Unions like to secure jobs for Americans, and pay for it’s workers. The problem is twofold at least, and this is why politicians have a problem this time around. 1. Unions derive their power from the workers and use it with politicians. Money is often funneled into campaigns, and there has been legislation about whether money can help fund a candidate. Certain candidates have taken union money, and have been endorsed by certain unions. Politicians in result feel obliged to protect unions as union’s helped bring them to power, so in essence certain politicians derive their power from the unions themselves. 2. While unions have helped protect US workers in many respects from greedy companies who’d just as soon pay as little as possible to workers to maximize profits, unions may also be the very thing that is driving jobs overseas and making US automakers anti-competitive. Now unions will argue that they protect jobs by not allowing companies to close plants or layoff people except under harsh circumstances. The reality is when buyers do not purchase US cars because they don’t offer the value a buyer is looking for, being anti-competitive does help push jobs overseas to automakers who are making cars people want to buy. I know many union workers here in the US make over $100,000 per year and work about 6 months a year when you add up all the days off and closed plant days. The unions negotiated such a good contract that our workers are protected. But are they really? When you negotiate something so good for our workers that it causes our auto companies to be anti-competitive and bankrupts a business, is that really good for our workers long-term? I would suggest that there may be a role for our unions, but they too must get into the 21st century and not demand so much from business that the business itself cannot sustain. GM and Ford have lost money for years, but because investors have kept investing in the companies they’ve maintained financing and cash. Those days are over now. The companies themselves must be competitive on the world stage, or we don’t really need them. This is unfortunate to say, because I believe we do need them and should have them. But we cannot keep doing business in an anti-competitive way and expect to keep jobs here in US. It’s sort of like states taxation rules. When one state offers tremendous tax incentives over other states, companies consider moving to another state. Why do you think so many corporations are in DE and SD? I’ve been told it’s because of corporate and tax laws those states have offered in the past. The same is true in business. US wages may be higher, and that’s OK because our workers may be more productive. But when you add on anti-competitive practices on top of higher wages, you wonder why worldwide buyers don’t always buy American, and in fact many American’s don’t buy American. We’re just at a very competitive disadvantage, and it’s a shame because Detroit is starting to crank out cars people want to buy. So here comes the big dilemma, and this is important as we discuss bailout terms, and it is the elephant in the room you’ll never hear a politician talk about because of the money and power involved in campaigns and unions. We’ve got to work on limiting CEO pay in these bailouts, and that’s popular with the people because everyone understands that. Before we give handouts to auto companies, we’ve also got to address a root of the problem, which is that our union contracts with these auto companies have placed them in a precarious and anti-competitive position. It is unfair to our workers to give them contracts that work them right out of a job. Before our government forks over more truckloads of good money after bad, let’s address a root problem and renegotiate some of these contracts so these companies can make it long-term. After all, they are asking for US tax payer money now. They didn’t make it on their own, so let’s try to fix what didn’t work before we give money to this situation. True, some jobs may be lost and some perks may be lost, but this is better than losing an entire industry and all the jobs being lost. The unions may lose some power, but how much power will they have if we lose an entire industry? Nobody is against the American worker, and it’s quite possible reworking some of these contracts now will be the only thing that may save some of the American workers. You cannot guarantee a job to somebody if you can’t sell a product people want to buy and make a profit doing so. We’re in a world market, like it or not, and that old philosophy’s days are not only numbered, but this financial crisis has proved that it’s days actually ran out long ago and we’re just now at the crossroads today. Let’s all work together to fix this mess instead of blaming everybody else. Just fix it, and let’s keep many of those jobs right here in the US. If we don’t, those jobs won’t be here forever, even with a bailout, because bailouts only provide financing for a short period of time and we’ll be right back here bailing them out a 2nd and 3rd time later on. And let’s see if the politicians address this issue like they do the CEO pay issue. Similar principle, but much difference in terms of how politicians get elected, so don’t bet on it. How the economy and jobs go so goes the housing market, so these decisions do affect housing markets.